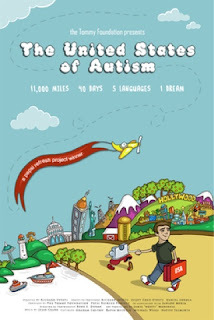 United States of Autism Coming to Grand Rapids, MI! Note: See updates below – we got a bigger screen room! It’s finally here! We’ve been talking on Twitter for weeks and weeks about the exciting United States of Autism movie. My Center is bringing it to Grand Rapids, less than a month after its world premier in New York City, on 04/30/2013. It’ll play at 6pm at Celebration Cinema North. United States of Autism follows an autism dad trekking across America to record the stories, the joys and struggles, of autism families. The journey lasted forty days, connecting twenty families across geographical and language barriers. I first heard about this movie from a friend and ally, Tim Welsh, an autism father and prolific blogger and activist for the cause, who is featured alongside his son in the movie (many people know Tim simply as Tanner’s Dad!). Click the poster below for the trailer, and I think you’ll see why I’m excited. One of the things I am trying to do here in Grand Rapids is to grow a stronger sense of autism community. Many of the families we serve feel like they’re going it alone, without resources or support or allies. Many don’t have connections to families with older children or young adults who’ve gone through what they are going through, nor are they connected with parents of even younger children who are trying to surmount the challenges they have already faced. Our PuzzlePartners and FamilyRounds programs, although aimed currently at the families of older teens and young adults with autism, are part of our effort to build this community. Bringing this movie here is an important part of that effort, too. The 30th caps off Autism Awareness Month (and it happens to be my birthday! ), and this is about not just being aware of autism, but using that awareness to drive action and empowerment. Last April, MI signed its autism therapy legislation into law. It went into effect in October, and this April, it is joined by the state plan and also the rollout of Medicaid autism services (in which we will be participating as a provider). The best news in Michigan is that this April, it doesn’t just stop at autism awareness. For the first time, even if they are not super wealthy or lucky enough to access scarce scholarship resources, we can tell most families that we not only can have a plan for serving their child with autism, but now we can execute that plan. So this one’s for all the kids beginning to thrive through our clinical therapies. It’s for the kids who upgraded to mainstream kindergarten or preschool from developmental delay or ASD classrooms. It’s for the kids who told their first jokes as a result of ABA. Is for the kids who read bedtime stories to their sisters. And most of all, it’s for all the kids in Michigan who will join their ranks in the year to come. I hope you can come out and celebrate with me! Let’s make the United States of America the United States of Awesome! P.S. if you’re not here in West Michigan, bring United States of Autism to your community. Tugg is great, and they’ll help you make it happen. If you need promoting help, I’m happy to tweet and retweet you, too! 04/04/2013 – We are CONFIRMED! Yes! One week on sale and we have, at the moment, just 14 tickets left. Buy your tickets now! If it sells out, we’re going to try and get an even bigger space at the theater and open up more tickets. It’s time for the Autism Family to make a show of force. Make it clear that Grand Rapids will be ground zero of the Autism Revolution. 04/05/2013 – Only 10 tickets left as of this morning! Wow! Fear not, we are already in the process of asking for a switch to a bigger room to open up more seats for you. We love you, Autism Family! 04/08/2013 – We are now sold out!!! Please stay tuned for news on if we can get a larger room and open up more tickets. 04/10/2013 – We got a bigger room! Tickets are back on sale!